Yellowstone National Park is at high altitude. Most of the park is above 7,500 feet / 2,275 meters. High altitude means cooler temperatures. Yellowstone’s weather is unpredictable. 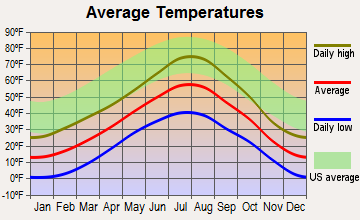 In summer, it may be warm and sunny with temperatures in the high 70s / 25 C. At night in any given month, the temperature may drop close to freezing (32°F / 0°C). So it is best to come prepared for cold evenings and mornings, especially if you are camping or hiking. When you leave your campsite, please leave it prepared for possible thundershowers and wind. A sunny warm day may become fiercely stormy with wind, rain, sleet and sometimes snow. Without adequate clothing and gear, an easy day hike or boat trip can turn into a battle for survival. Exposure to wind, rain, or cold can result in hypothermia. Be prepared! Cold and snow linger into April and May, although temperatures gradually climb. Average daytime readings fall in the 40s to 50s / 5 – 15°C, reaching the 60s and 70s / 15 – 25°C by late May and June. Overnight temperatures fall below freezing and may plunge near 0°F / -20°C. These are statistical averages; actual conditions can be vastly different from long term “norms.” At any time of year, be prepared for sudden changes; unpredictability, more than anything else, characterizes Yellowstone’s weather. Storms in late May and early June may result in significant accumulations of snow–up to a foot of snow in 24 hours is not uncommon. We recommend that you bring a warm jacket and rain gear. Spring visitors should be prepared for any type of weather. Call ahead for current weather and road information since sudden storms may result in cold temperatures, snow and/or temporary road closures. Yellowstone’s weather is always unpredictable. Carry extra clothing when hiking. Good walking shoes and layers of clothing are recommended throughout the year. Average maximum summer temperatures are usually in the 70s / 25°C and occasionally in the 80s / 30°C in the lower elevations. Nights are cool and temperatures may drop into the 30s and 40s / 0 – 10°C. Depending on the elevation, temperatures may even fall into the 20s / -5°C with a light freeze. June can be cool and rainy; July and August tend to be somewhat drier, although afternoon thundershowers and lightning storms are common. During lightning storms get off water or beaches and stay away from ridges, exposed places, and isolated trees. At any time of year, be prepared for sudden changes; unpredictability, more than anything else, characterizes Yellowstone’s weather. We recommend that you bring a warm jacket and rain gear even in the summer. If you plan to visit Yellowstone during spring or fall, call ahead for current weather and road information since sudden storms may result in cold temperatures, snow and/or temporary road closures. In summer, stop at visitor centers or ranger stations for weather forecasts. Always carry extra clothing when hiking. Good walking shoes and layers of clothing are recommended throughout the year. Fall weather can be pleasant, although temperatures average 10 to 20 degrees lower than summer readings–highs in the 40s to 60s / 5 – 20°C. Over night temperatures can fall into the teens and single digits / -10° to -20°C. Snowstorms increase in frequency and intensity as the weeks go by. At any time of year be prepared for sudden changes; unpredictability, more than anything else, characterizes Yellowstone’s weather. Sudden storms can cause a drop in temperature or result in precipitation. Always carry extra clothing when hiking. Good walking shoes and layers of clothing are recommended throughout the year. If you plan to visit Yellowstone during spring or fall, call ahead for current weather and road information since sudden storms may result in cold temperatures, snow and/or temporary road closures. Winter temperatures often hover near 0°F / -20°C throughout the day but may reach highs in the 20s / -5°C. Subzero over night temperatures are common. Occasionally, warm “chinook” winds will push daytime temperatures into the 40s / 5 – 10°C, causing significant melting of snowpack–especially at lower elevations. Yellowstone also typically experiences periods of bitterly cold weather. The lowest temperature recorded in Yellowstone was -66°F / -54°C near West Yellowstone on 09 Feb 1933. Annual snowfall averages near 150 inches / 380 cm in most of the park. At higher elevations, 200-400 inches / 5 – 10 meters of snowfall have been recorded. At any time of year, be prepared for sudden changes; unpredictability, more than anything else, characterizes Yellowstone’s weather. Snowmobilers and skiers should always check on temperatures and wind chill forecasts; subzero weather can make travel dangerous even with proper gear. Always carry extra clothing when hiking, skiing, or snowmobiling. Take advantage of the warming huts (heated shelters) provided in some park areas. Good walking shoes and layers of clothing are recommended throughout the year, but in the winter you’ll also need warm boots. Cross-country skis or snowshoes are a ‘must’ in winter if you plan to go beyond the main roads and boardwalks.